Kate has welcomed death from an early age. With no family to speak of and a brother she hates, she waits for death to take her away. It speaks to her. Teases her, yet will not come for her. Death takes those around her, making her desire for it greater than ever. On the way home, Kate picked up some lamb chops and some white wine for her lunch with Sam, inwardly still trying not to be angry with Michael. Who did he think he was? Regardless of the fact him turning up was something she had dreamed of for years, he still had the cheek of the devil. There was an ambulance outside Janet’s house and Kate’s heartbeat accelerated as she walked towards it, wondering who it was for. As she drew closer, she saw Janet’s door was open and as she watched, a paramedic in a reflective yellow striped jacket was wheeling Janet out of her house in a wheelchair. She appeared to be asleep, her face pale and peaceful. What had happened? ‘How did she tumble, she has no stairs?’ Kate asked. Kate had the strangest feeling Janet wouldn’t be ‘fine’. She was far too old to be taking a tumble. She decided to spend the rest of the day in her studio after she had something to eat and if Janet wasn’t home by tomorrow morning, she would go and see how she was. The rest of the afternoon was spent preparing the next canvas. This one was going to be a night scene, with the moonlight like a pathway across the water. That was the plan anyway, and that sometimes changed as her paintbrush often had a mind of its own. As the afternoon faded into early evening, Kate found herself thinking about Michael a little more fondly than she had that morning. She had almost seemed rude, hadn’t she? God knows what he made of it. She was in the kitchen, waiting for the kettle to boil when there was a knock at the front door. Who could have that be, she thought, wondering if it was something to do with Janet. Kate’s heart was in her mouth as she opened the door to find Michael standing there with a small bunch of carnations clutched to his chest. She almost choked, and her first instinct was to slam the door, but for some strange reason, she couldn’t. Kate still hesitated, unsure whether to let him in or not. This was her private space; did she want him touching everything? She tried to accept them gracefully, knowing she would prefer to wrap them around his neck, and made her way to the kitchen to put them in water. He stood in the doorway watching her, and it all seemed the most natural thing in the world as if he had done exactly that dozens of times before. It suddenly occurred to her just how much she resented him showing up on her doorstep. Why did she automatically think he already knew the answer to that? ‘Not long ‘, she said, non-committedly. ‘And I will soon be moving on, anyway’. He smiled, and there was just a hint of nervousness in his smile. Was it possible he was a little unsure of his reception? His smile vanished, and she could see he was trying to think of a suitable answer. Whatever he said, she wouldn’t believe a word. It was as if he knew what had happened to Dylan, and how could he, unless… The possibilities that presented themselves didn’t bear thinking about, and she knew something was wrong. Nobody would say a thing like that by chance. ‘I don’t know why I said that, Kate. The way you’re carrying on, something did happen to the cat. What was it? The cheek of the man took her breath away, which was just as well for she had no intention of telling him anything. The door was open, so he already had a good look in her opinion. She leaned past him and closed the door. ‘I would rather you didn’t if you don’t mind,’ she said, not caring she came across as more than a little angry. He looked surprised, but what did he expect? Had he forgotten how badly he had let her down, not to mention walking out on the child they had made together? For a moment, he managed to look sad, but if that was supposed to mean anything to her, he was badly mistaken. Although a small part of her still loved him, a bigger part resented him for turning up like this, assuming she would forgive and forget. She hadn’t been able to do it then and certainly wasn’t about to do it now. Kate went to open the front door, desperate to get him out of her flat. Just as well I’m leaving, she thought, as knowing he knew where to find her was annoying her a lot more than she thought it would. ‘Can’t we just talk about this, Kate,’ he said, trying to look sheepish. As he walked away, she waited for him to turn around, to appeal to her one more time. He didn’t, he kept on walking and for a split second it was all so sad she felt like crying. He didn’t appear to have come by car. If he had, it must be parked somewhere else. Why would he do that? As Kate stood on the doorstep, she noticed there were no lights showing at Janet’s house. Did that mean she was still in the hospital? She would have to ring them in the morning and find out what was going on. She didn’t feel in the least like painting, and went to the studio and stared at the canvas. She should work on it a bit more, after all, Sam was coming for lunch tomorrow and the more progress she could see, the better. It might help to get all thoughts of Michael out of her head, so she would have no trouble sleeping tonight. She tried to empty her mind of him as she spent the next few hours pushing paint onto the canvas, and one question kept rattling around in her head. Why had he assumed something happened to her cat? It might have just been a coincidence; after all, there was a cat flap in the back door. It could have been for the previous tenant’s cat. It was almost as if he knew something bad had happened, but how could he have done? Did he kill her cat? Not sure what I was looking for, but during my browsing the other day, I came across an article about a clockwork lion. The picture intrigued me, being a lifelong visitor of the lions in Trafalgar Square in London. When I was a small child, I remember visiting Trafalgar Square a lot. It seemed like a magical place to me, what with the water fountains, thousands of pigeons and those enormous black lion statues. So when I saw this article, I knew I had to know more about it. Time is beginning to run out for all of the big cats, and to put it into perspective, there are apparently more statues of lions in London than still roaming in the wild. I was upset when I heard about the killing of Cecil, the famous African lion, but maybe something good could come out of it after all, for it sparked a global controversy and set off a backlash against the African hunting industry. Inspiring the creation of this incredible piece of art at the same time. I think the gaunt frame, torn hide, and wide, harrowed eyes of the Clockwork Lion give a drastically different impression than the steady, powerful look of the famous Landseer Lions around him, dramatically illustrating the decline wild lions have experienced since the original statues were installed in 1867. The sculptor has made the lion seem very real, the agony on its face almost too painful to see. If I look at it for too long, it makes me cry. My daughter and granddaughters gave him to us and he has been a great blessing. Each day he greets you when you rise, very vocally. He talks a lot and sits on the arm of my chair, his face too close to mine. I have the feeling he wants to get inside my head. I cannot reach for my coffee, so I shoo him away. My son says he doesn’t know why he loves me so much. I am told that whenever I leave the house, he howls, for he doesn’t like me to go away. I call him dog because he acts like one. There are times he follows me so closely that I trip over him. #WordlessWednesday ~ Guarding the Books! The recent hot weather has finally eased and I for one am delighted. Now, I can resume normal duties without running the risk of collapsing in a soggy heap! There was a point when the heat was at its hottest when I almost lost the will to do anything, and being unable to sleep at night wasn’t helping at all. On one of the unbearably hot days, I made the mistake of asking the family what they wanted for dinner. When they requested pasties, my heart sank. We usually had them for picnic meals with salad, perfect for a hot day, but first I had to make them, then cook them in a hot oven! 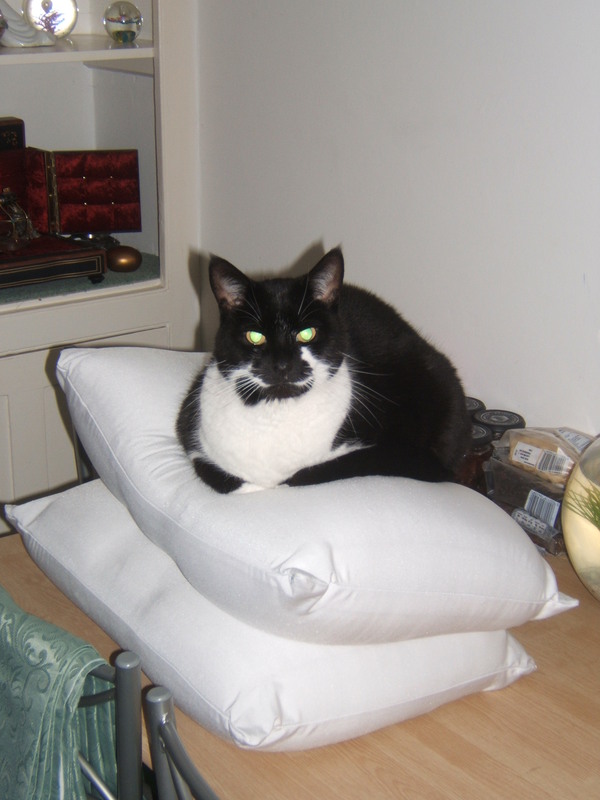 Another reason I am so glad the weather is cooler now is for Merlin, our aged black and white cat. He really has been suffering and watching him as he tried to find a cool place to lie down has been distressing for us as well as him. There were moments when he looked as though he couldn’t last much longer. In fact, there were times when he looked dead and my heart was in my mouth until he moved or flicked an ear. What passes as a lawn in our garden has suffered too, and won’t need cutting any time soon as all we have at the moment are funny green tufts sprouting through the straw coloured dead grass. This is more than I can say about the dreaded forty-foot long, seven-foot-high hedge. It has gone more than a bit crazy, with long branches shooting out in all directions. It will need a trim soon. Not much writing was done during the heatwave unfortunately, something I am trying to remedy now it’s cooler. I’m not sure why they call it a wave, wouldn’t that imply that it passes quickly, and that definitely didn’t happen. We were all being forced to live in a world that had turned into an unbearably hot oven, and it wasn’t funny. I love a bit of good weather, but don’t appreciate being cooked the minute I step outside. So keep it down to a comfortable level, please? You just know that life is returning to normal when computers find new ways to annoy. The latest game is ditching any comments I make on other people’s websites. You go to the bother of commenting, and not just ‘nice post!’ only to have it vanish without a trace. And I don’t know about anyone else, but my brain never remembers exactly what I just typed, so the second attempt is usually not as good or as long. Not acceptable, right? We have claimed a BookBub profile and all of our books are locked and loaded! Not sure how any of it works (no change there then) but if anyone wants to follow us on there, here are the links to Jaye’s BookBub and Anita’s BookBub. I listened to the thunder approaching as I caught up with writing the next chapter of my WIP. It sounded slightly ominous, but in a half-hearted way, if you know what I mean. We seem to get a lot of this half-hearted weather down here in Hampshire. They say it has something to do with being so close to the South Downs. It kind of messes with the wind currents or something. At this stage, there was no way of knowing if it the storm would ever reach us, or veer off somewhere else. In the end, we had a few more rumbles and that was it. On to the next disappointment. The eclipse. Wall to wall cloud made sure we didn’t see anything, either the moon or the eclipse. We had been watching the moon all week as it slowly became full, only to have nothing at all to see on the night in question. We were in good company, for no one else in the UK saw it either, but the awful sticky heat had gone, and I could really concentrate on my writing. Word count has gone up by nearly 5000 words this week! They promised rain, which would be more than welcome, as I could hear the garden screaming for moisture all way inside my office. But when it did rain, it wasn’t the deluge they promised, just a quick half-hearted shower, but better than nothing, I suppose. After a damp and slightly chilly weekend, I had the opportunity to play truant, and I didn’t hesitate. It was like the Prisoner of Zenda escaping, as I ran and jumped in the car, ready for the off. An afternoon walking around The New Forest? What’s not to like? There will be lots of pictures and post to follow! During the heatwave, we had an unwanted disturbance late one night. We had not long been in bed and couldn’t sleep as the heat was stifling. We heard a commotion downstairs and thought we were being burgled. We were about to investigate when we heard bottles clinking. A thirsty burglar? What was going on? The culprit turned out to be Merlin, our beloved black and white cat. He tried to look innocent, but we knew what was going on. Somewhere in our house was a very small but unwelcome visitor. After crawling around on my hands and knees, looking in all his favourite places, I managed to track it down to the dining room, where Merlin had the tiny mouse cornered under the table. I managed to grab it with an old tea towel and take it out to the garden. My son, Stephen took this video with his phone the other day, and I had to share it! Murder at the Cat Flap! I recently wrote a post about how our house was fast becoming a cat motel and the need for a revolving door cat flap. It was an amusing situation, although it was costing us extra money for the extra cat food. But with the onset of The Beast from the East and all this snow and ice, the situation has changed dramatically and there have been even more feline visitors. I try not to think that they are all suffering from malnutrition, that they just prefer our cat Merlin’s menu to their own, but for whatever the reason our cat flap is subject to some serious abuse. Before all this pitifully cold weather, our visitors were amenable and very respectful of the facilities. Merlin tolerated the frequent invasion of his territory, preferring to watch from a distance. He obviously trusted us to make up the shortfall in his rations, and although we moaned about it from time to time, it was rather sweet to see so many cats wandering through our kitchen. This situation has changed dramatically with the weather and a new arrival. He is a huge cat, with long black shaggy fur that almost brushes the ground when he walks. His tail, also long and shaggy, must be the envy of every cat in the neighbourhood. He isn’t scared or respectful, although he seems to want to be friendly, the least he could do, I suppose, seeing as he comes back several times a day! But we have discovered, alarmingly, that Merlin cannot abide him. He will ignore Shaggy’s presence if he is elsewhere in the house, but if he is anywhere near the kitchen, all hell breaks loose and I fear for Merlin and the cat flap. I don’t like hearing cats fight, even though I know it isn’t usually to the death, just a lot of wailing and hissing, but the sounds coming from our kitchen I swear could chill your blood! I think the cat flap suffers the most and may have to be replaced, sooner rather than later. We worry about Merlin a lot more these days, as he isn’t getting any younger. He will be 14 years old in May and on bad days, he can’t quite do what he used to be able to do. We have talked about locking the cat flap at night (something Merlin will not tolerate. The last time we had to for medical reasons, he almost ripped it off the door!) Hardly any point though, for most of the fights happen during the day. We also talked about moving Merlin’s food upstairs, and out of reach, but the thought of Shaggy patrolling the house, looking for food soon stopped that idea. The other question that keeps me awake at night is why does Merlin resent this cat and not any of the others? I have heard that other, less endowed male cats automatically fear male cats that still have all of their bits (I think you know which bits I refer to). This may well be the case, for I have been watching Shaggy when he leaves our house, stuffed to the gills with the best quality cat food. He backs up to several things in our yard and shakes his rear end at them. This, I believe is scent marking and something only entire males can do. This upset me even further, for not only does Merlin have to put up with Shaggy’s presence and attitude (and loss of feeding privileges), he is also surrounded by the smell of Shaggy everywhere he goes! I am thinking of getting one of those water pistols to try to deter Shaggy, but I think I already know I would be wasting my time. This huge cat, although lovely, is not welcome in our house, and I hope he finds another cat hotel and soon! If anyone can suggest a solution for poor old Merlin, we would love to hear it!